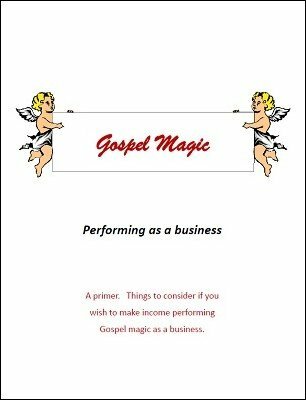 Gospel magic can be done as a business. But there are steps in the planning process, research needed in the market place and calculations that have to be done first. There are times we can make the decision. Then there are others where the decision is made for us. This ebook will give you a strong foundation approach. It will identify how you determine expenses, project income and how to plan for your net profits. If you do your homework this book will identify if making an income is practical in your area. Magicians perform Gospel magic for free, some charge to recover their expenses and others plan on bringing in income. There is absolutely nothing wrong with any of those postures. The only strong exception I would make is if you find yourself with unlimited income potentials you still hold to the: "high quality performance in exchange for a fair market price". Gospel magicians do not own massive estates, expensive yachts or multiple hotels. However they do have family obligations, education expenses and other income needs just like any one else. This text will help you determine potentials for income in your area. And, if those calculations do not support it as a business you will still be able to determine how much your performances are costing you.